Drs. D’Arcy Meyer-Dombard and Fabien Kenig in UIC’s Department of Earth and Environmental Sciences are part of a multi-institutional team funded to study the “Habitability of Hydrocarbon Worlds: Titan and Beyond”. The interdisciplinary and highly synergistic research effort is led by Rosaly Lopes at NASA’s Jet Propulsion Laboratory. The project combines experimental, theoretical, and observational involving 17 Co-Investigators and 10 Collaborators from 16 institutions in the US and abroad. 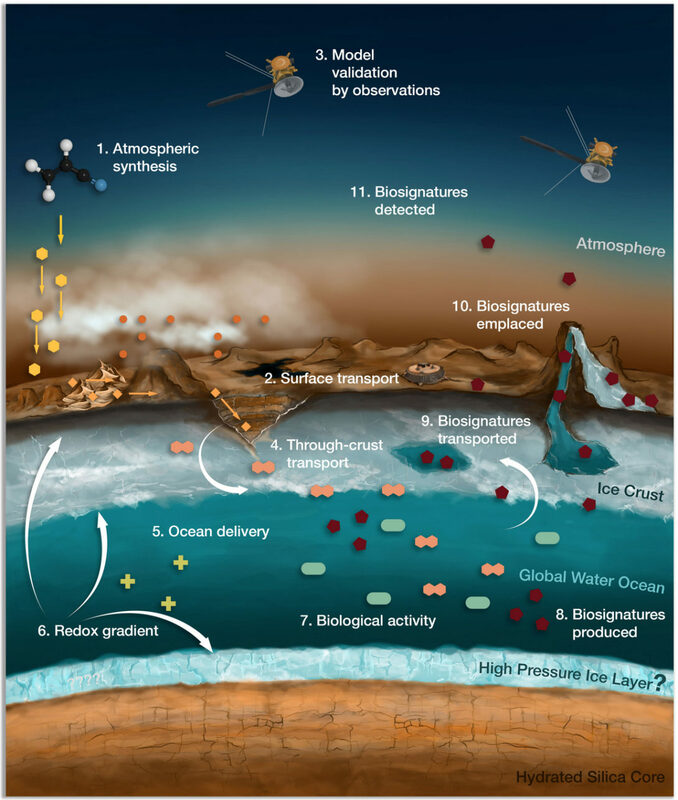 Their goal is to answer a key question in astrobiology of the solar system: What habitable environments exist on Titan and what resulting potential biosignatures should we look for? The UIC team, which will include many undergraduate students, 3-4 graduate students, and several post-doctoral researchers as well as Drs. Kenig and Meyer-Dombard (third-objective lead) is responsible for the innovation and research for the third-objective of the project: To determine what biosignatures would be produced if Titan’s subsurface is inhabited by microorganisms. A ‘biosignature’ is any chemical or physical clue that might be left behind by organisms that are either currently living, or perhaps were living in a past, but extinct, Titan ecosystem. These biosignatures can be detected by an array of instruments that could be sent to orbit or land on the surface of Titan. Their main objective is to explore what these biosignatures might look like on Titan. Titan’s potential environments are very different from Earth’s. Titan’s subsurface provides an experimental challenge because pressures involved are 2-8x higher than previously explored life-supporting Earth environments. The highest pressure environment explored on Earth is Challenger Deep (110 MPa) and the coldest high pressure environment is ~275 K. In contrast, Titan’s ocean pressure begins at 200-300 MPa under the ice crust, extending near the GPa range at the core-ocean interface. Titan’s ocean is also cold (~ -15 ̊C below the ice crust to ~10 ̊C at the ocean core boundary). The consequence of these ‘extreme’ conditions is that biosignatures found on Titan may look very different from those that are found on Earth. Drs. Meyer-Dombard and Kenig will develop a state-of-the-art high pressure chamber that will allow them to grow microorganisms at these conditions. They will then explore the effect of the high pressure and low temperatures on biosignatures, such as the structure and types of lipids that make up the membranes of the microbial cell walls, and changes that might be induced in the genomes of the microorganisms. These experiments have never been attempted before, and are anticipated to provide the scientific community with innovative instruments and novel data.